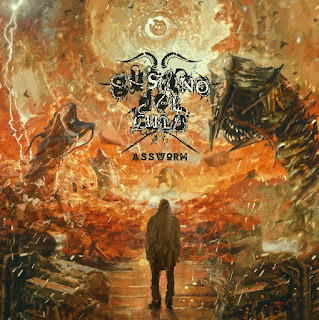 Groove metal outfit Gusano del Culo from Ukraine have signed a worldwide distribution deal with Swimming With Sharks Entertainment. Their debut release entitled "ASSWORM" was produced by Konstantin Ratnikov (Anvil Records) and is out now. The group is heavily influenced by artists such as Sepultura, Slipknot, Coal Chamber, Korn, Soulfly, and Slayer. The aggressive music of GDC explores themes of pain, depression, loneliness, hate and suicide. Frontman Dima Klubov states, "We’d like to thank Noah "Shark" Robertson and Swimming With Sharks Entertainment. Also, Konstantin Ratnikov, Alexander Cherminyov, Nick Kushnir, Sergey Bilenko, Sergey Kochmar, and Andrew Dodor. And thanks to everybody who supported us and continues to support us. Thank you!" Gusano del Culo (GDC) is an Experimental/Nu/Groove metal band from Cherkassy, Ukraine. The band was formed in 2014 by Alexander “MEAT” Cherminyov, Oleg Tcygankov, Ilya "PLUSHIK" Bryklya, Alex "HELLBOY" Kydriavtsev and Dima "DEE KAY" Klubov. In October of 2017, GDC performed their debut show, METAL NIGHT in Cherkassy, Ukraine; sharing the stage with Midgard, DEATHINCARNATION and Demonologist. "ASSWORM" is available March 9th, 2018 via Swimming With Sharks Records, Zombie Shark Records, iTunes, Amazon, Spotify and everywhere music is sold.